A squeak near the front passenger wheel had me concerned. 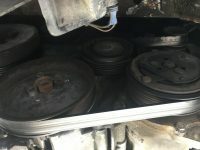 I removed the belly pan cover (many people don’t have one for their van). I wasn’t exactly sure where the squeak was coming from. It did tend to increase and decrease with the RPMs. 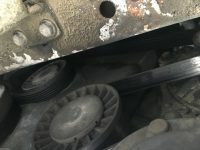 After an exchange with Thomas EXVCDS about my battery/alternator, I was able to determine that the squeak was just the belt. He suggested spraying a bit of water on the belt. If the squeak went away temporarily, then the cause was likely the belt… not a mechanical/alternator issue. 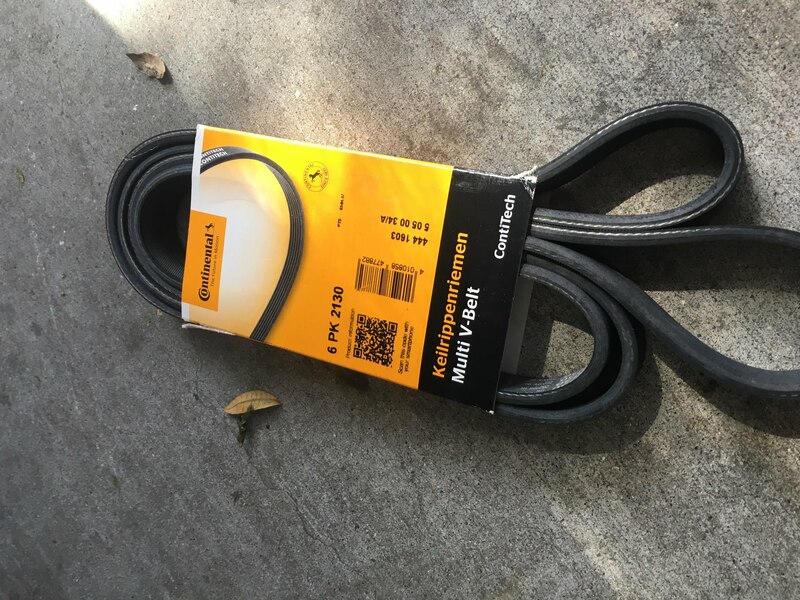 So I ordered a replacement serpentine (aka generator) belt from Europarts-SD.com. I also ordered the “emergency belt” that by passes the AC condenser so I can keep it as a spare. Put on your eye protection. If you care to, put the Eurovan on ramps/jack stands. It will be much easier with some room. 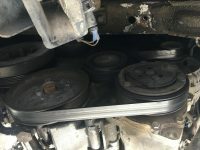 Installing the new belt was quite simple once I understood how to get it off the tensioner and remove the old belt. At first, it looks as though I might have to remove a bolt or something, but this isn’t the case. The belt can be completely removed with a bit of dexterity and patience. Pull down on the bottom to get the belt to release a bit, and then remove it from the pulleys and guides. When it is off of all them except the tensioner (which is in a tight and awkward space), then you need to get the belt to lay flat and pass it behind (toward the driver side) the tensioner. Installation is just the reverse. 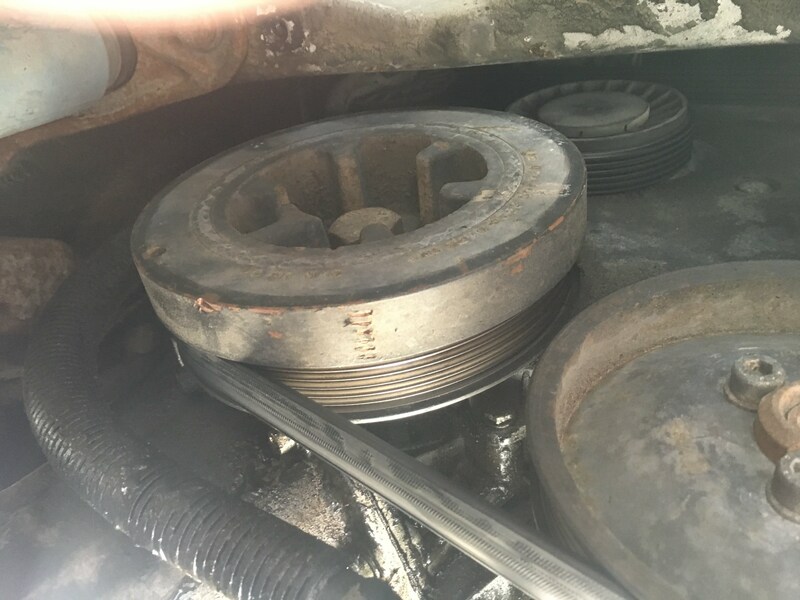 After getting the path correct (take pictures before you uninstall the old one, just in case), I could not get the belt back on the final pulley. I had to give it some muscle to get the tensioner to release a bit. Once it was mostly on correctly, I turned all the pulleys/belt by hand to ensure that the belt was properly seated. 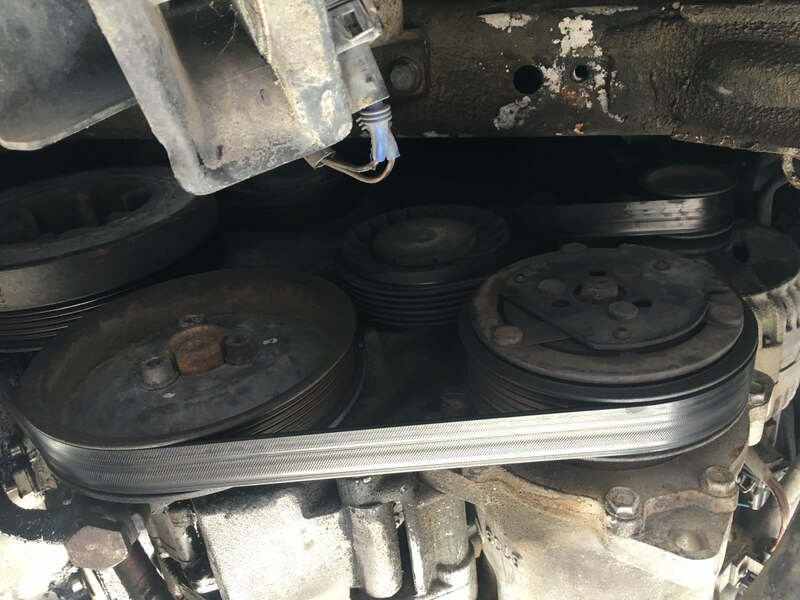 Here is a video from Thomas EXOVCDS for replacing the serpentine belt.